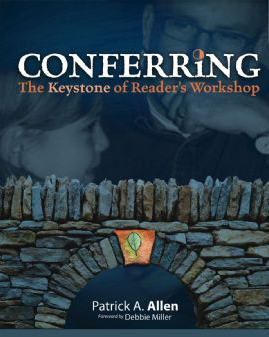 I read Patrick Allen’s book Conferring: The Keystone of Reader’s Workshop a while back, but reread it when Cathy Mere started a cyber discussion about it a few weeks ago. Recently, I was re-skimming the last few chapters and I got inspired to want to work with upper elementary grades again. Since retiring and moving into consulting work, I am only in a school one day a week for volunteering and research. For the past few years I’ve always been in first or second grades supporting classroom teachers with their struggling readers. But I’m thinking of taking a whole new direction this school year. I love the literature that 4th and 5th graders read and I have really missed it. Patrick’s book is so rich with scenarios of him sitting, chatting with kids, that I could feel myself right there! And I want to be there too. I particularly like that Allen’s format of RIP (his structure for a reading conference) has three words for each part of his conferring framework. His RIP is so open and useable for any teacher to make his/her own. The “I” section can be instruction, insights, or intrigue. And that is so true. Sometimes it is just an insight into the child’s thinking that we make note of, sometimes we are surprised by a response given, but sometimes we need to do some hard teaching. It is the instructional piece that concerns me the most. In many of the examples throughout the book Allen confirms or reinforces a strategy that the child has used or he names it for the child. One could tell that he had done incredible work at the beginning of the year to get all this going. His students select books well and for the most part comprehend them. But I have been in many situations (and I’m sure we can all say this) where the child doesn’t comprehend what he is reading. The student may be in a book that is way too hard to read independently; the student might have a fluency issue; it’s possible he’s not self-monitoring; it might be that his word analysis skills are lacking; there may be unfamiliar vocabulary and she’s not sure how to use the context clues to make it make sense; it could be that the child’s mind wanders and he doesn’t have strategies to help him stay engaged with the text, or any other number of things. As Patrick said, it’s hard to make a quick analysis of what this child needs right then at that moment, but with practice we will all get better. Our strongest teaching will come into play when the child we are conferring with is NOT understanding. The instructional piece then means that we have to support that child as we hook him/her back to an anchor lesson or a shared demonstration lesson. v Remember when we read that ______ article together and we all thought of some questions we had before we read. I wonder if that will help you here. Let’s try it together. v It seems like there were some words in this part that you were unsure of. Let’s go back to some of those together and I’ll show you what I might do. v Poems say a lot in so few words. I find I understand them better when I make pictures in my mind. Would you like to try that with me here and see if it helps us understand this poem better? In the last chapters of Allen’s text he asks us to return to our chart we made earlier about “what emerges from a reading conference?” Luckily I had my paper stuck inside my book. I was amazed with all I had written and was happy to reflect on it once again. I will take my chart along with my book to school next year and see if there are 4th and 5th grade teachers who would like to explore conferring with me. I can’t wait for the fun (and the hard, but satisfying work) to begin! I loved this book as well. It is such a great resource for those who are just getting started with conferring, as well as teachers who have experience with conferring. I am excited for his new DVD resource focusing on conferring that is coming out from Stenhouse. I loved this book as well and used it as a resource when I taught a grad class on Gail and Joan’s CAFE. Glad to hear there is a DVD coming out. I’ll look for it! August 10 for 10: 10 of our Favorite Picture Books!